Le Hangar – Pôle national Arts de la Rue et Cirque in Amiens presented Street Arts from ZEPA in Abbeville as part of the European Cooperation Day 2012. This Franco-British event was part of the ZEPA network as well as being one of this year’s European Territorial Cooperation projects put forward for the first European Cooperation Day. On the European Commission’s initiative, this campaign called Sharing Borders, Growing closer wants to promote territorial cooperation among the large public and the media through different projects. More than 160 events will be highlighted during the campaign which is taking place throughout September…including 3 ZEPA events ! 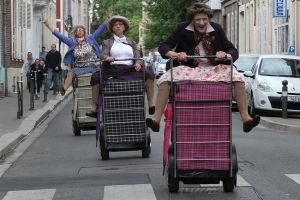 Street Arts, an event was initiated by Le Hangar alongside with the Cultural Centre of St André d’Abbeville as part of the Franco-British network ZEPA, itself supported by Interreg IV-A France (Channel)-England Programme, one of the 65 territorial cooperation programmes…From local to European level ! 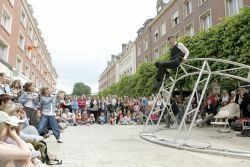 This event followed on from the actions engaged in 2011 in Amiens with Street Arts in St Acheul and the scheduling of numerous British companies associated to ZEPA involved in Confluence Nomade 2011-2012. Here was the programmation !!!! For more information on Street Arts in Abbeville and on the European Cooperation Day, click on the links. To watch the European Cooperation Day campaign’s video, click here.